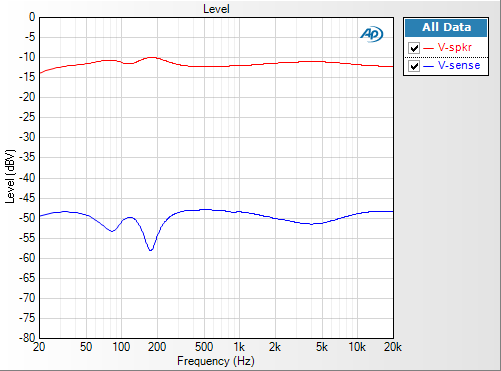 Measuring a loudspeaker’s complex impedance can easily be done in APx500 using derived measurements (available in versions 2.6 or later). This article describes how to do so using the Constant Voltage method, and includes an accompanying APx project. The main advantage of the Constant Voltage method is that the speaker can be tested with a known, constant voltage at all frequencies. By running the test multiple times at different levels, it can be observed if the impedance curve is level dependent. Figure 1. Schematic of loudspeaker impedance test. Figure 1 shows a basic schematic of the Constant Voltage method, while Figure 2 shows the actual connections. Two analyzer inputs, configured as analog balanced, are used to make the measurements: One channel measures voltage across the sensing resistor (Vsense), and the other measures voltage across the speaker (Vspkr). The power amplifier provides the ultra-low output impedance and high current necessary to drive low impedance speaker loads. While the analyzer can be used to drive the speaker directly, some combinations of output voltage and speaker impedance may exceed its maximum output current. In addition, the minimum 50 Ω output impedance of the analyzer feeding a speaker creates a current source, defeating the main advantage of the Constant Voltage method. To make the connections easier, we constructed a measurement test jig that contains the 0.1 Ω 50 W current sense resistor (Figure 3). This jig has dual banana binding posts on each end, and an XLR connector on the side, which makes for easy connections to the audio analyzer, the speaker, and the amplifier. The jig shown is one-of-a-kind, but you can easily construct one yourself. Figure 3. Current sense test jig. The resistance of the sense resistor is not critical, but it should have reasonable precision (say 1%) and a sufficient power rating. A value of 0.1 Ω is a good choice, because it does not significantly compromise the low output impedance of the constant-voltage source, and a division by 0.1 (or multiplication by 10) is convenient. Four-terminal current sense resistors are available for use in a Kelvin configuration, in which the current is supplied through two opposing terminals and the sensing voltage is measured across the other two terminals. In addition to offering more convenient connections, the 4-wire Kelvin configuration provides more accurate sensing measurements. Examples include the Ohmite 10 series and the Riedon UAL series. In the equations above, the bar above i, V, and Z denotes that they are phasor quantities (i.e., they have both a magnitude and phase). Figure 4. The Level measurement (primary) result. In the accompanying project file “LoudspeakerImpedance.approjx”, the impedance is derived from the Level result in the Acoustic Response measurement (Figure 4). In practice, any of the frequency response measurements could be used—Acoustic Response was chosen because it is fast and allows multiple averages to be taken. Note that because this is not really an acoustic measurement, the Time Window setting on the Impulse Response and Energy Time Curve measurements is not relevant. It should therefore be set to the same value as the sweep time. In this project file, a sweep time of 1.0 seconds has been set. 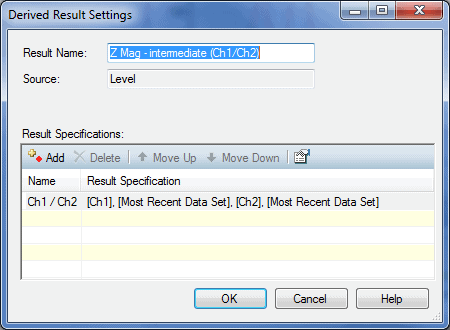 As shown, the input channels have been re-labeled in Signal Path Setup to Vspkr and Vsense, for convenience. Figure 5. Intermediate result for impedance magnitude. Figure 6. 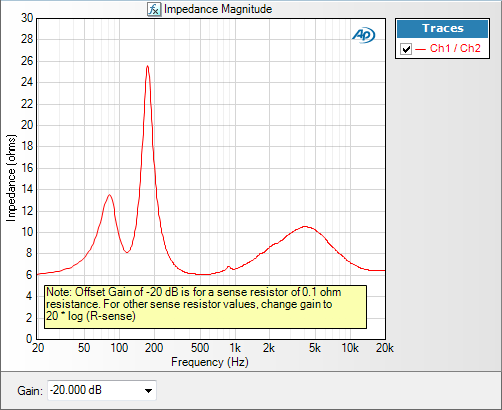 Impedance magnitude (derived). 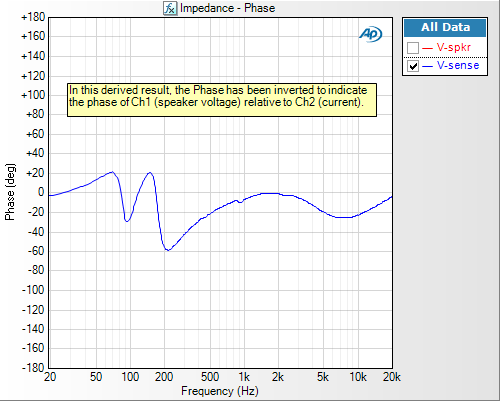 Finally, to get the impedance phase (Figure 7), we used an Invert derived result on the primary Phase result. This is to correct for the fact that the primary phase result is the phase of channel 2 relative to channel 1, and in this case we want the phase of the speaker voltage (channel 1) relative to the current (channel 2). Alternatively, we could have just swapped the two measurement channels and this invert operation would not have been required. Figure 7. Phase magnitude (derived). This entry was posted in Measurements, Technical Library and tagged APx515, APx52x, APx52x Series, APx58x, APx58x Series by Sean. Bookmark the permalink.